Ever since I read something Caroline Hirons said about it being a good idea to switch up and rotate your cleaners a lot I've been using it as an excuse for me flitting from one product to the next and having several on the go at any one time. I always told myself that doing this kept my skin on its toes and mixed up the benefits of the different products - maybe I was right. I find balms one of the most luxurious ways to cleanse. I'd originally compared this to Liz Earle's cleanse and polish, which is one of my all time faves, as it comes with a muslin cloth similar to its Liz Earle counterpart. But the similarities tend to end there - this isn't a thick and creamy white cleanser like I may have expected - it's an oil based balm with a thick gel like consistency. It glides over the skin and melts in - I enjoy giving it a good old massage around my face and it smells lemony and fresh. I don't use it to take off eye makeup and would usually take that off first with one of the below. But, this doesn't sting when I used it around my eyes and although its a natural product, it feels like it delivers with its gently exfoliating oatmeal. My skin feels super clean and glowing after I've used this, and the muslin cloth removes all traces of the oil. This is my favourite high street alternative to Bioderma. I think it's really quite similar, and you can't knock it for value for money - £4.99 for 200ml and it's often on offer. I'm on my third re-purchase of this one because it's such a good all rounder. It takes my makeup off quickly and easily including mascara and it doesn't sting my eyes at all. It's possibly a little bit drying, but I'd always be following with a second cleanse or a moisturiser anyway. When I first tried this I assumed it was a cleanser you'd wipe on and off with cotton pads, and I wondered why it left my skin feeling all oily. Should have read the instructions - it's actually like a proper cleansing oil you massage into the skin and then wash off. I'm getting along much better with it since I started following the directions. My initial mistake has helped me find the best way to use this though - I like to put it on a cotton pad to take off my eye-makeup before doing the rest of my face and rinsing it all off with water. This cleanser is excellent on waterproof mascara or long-lasting liner. It doesn't sting my eyes, but it does leave me blinking and blurry for a bit after using it which is an unfortunate side-effect but one to expect when using an oil product around the eyes. This micellar water from REN is a really gentle cleanser - it contains rose otto oil to calm and soothe plus tannin to tighten pores. It removes foundation well, and it leaves my skin feeling comfortable. Unlike most micellar waters this one isn't drying on the skin. I don't think it's really intended for using around the eyes as I found it didn't deal well with my mascara and it made my eyes sting a little. I've been using this one just on the rest of my face and completely avoiding my eye area as I've got really quite sensitive eyes. This cleanser from Radical Skincare is designed to cleanse, tone and hydrate the skin all in one. 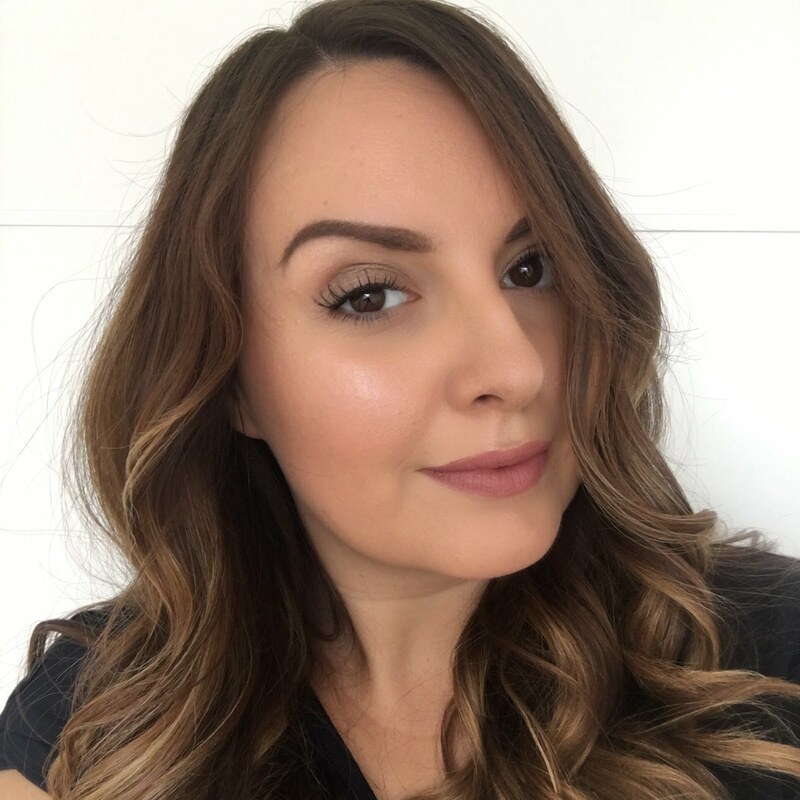 Hydrating is the key word with this - it's lovely and creamy and has a delicate, fresh scent to match its pretty peach colour and it's totally non-drying. I really enjoy using this one in the shower. It gets my skin really clean including removing eye makeup well (although again, I would usually remove that first with one of the micellar waters or the L'Oreal oil). The only thing I don't like about this cleanser is the price, and that's probably the only thing that might stop me from buying a replacement when I run out. What's your favourite cleanser at the moment? I've always got room to add another to my collection! I'm off on holiday on Saturday - finally! It's felt like such a long wait and I'm super excited to be going back to Vegas. Life and work has continued to be hectic and sadly that's meant no time for blogging which I'm really frustrated about. Hopefully after my holiday I'll get back into a proper routine again. Here's a little peek into what I've been up to lately and if you want to follow my adventures in Vegas check out my instagram - fluttersparkle. 1 - my brother's gone to Universal Orlando, so of course I've asked him to get me a fluffy unicorn! 2 - I managed to get my hands on a gold iphone! Well worth the horrendous early morning queueing. 3 - How beautiful is the new Michael Kors makeup packaging? 2 - using up some lush - how awesome does this one look as it fizzes? 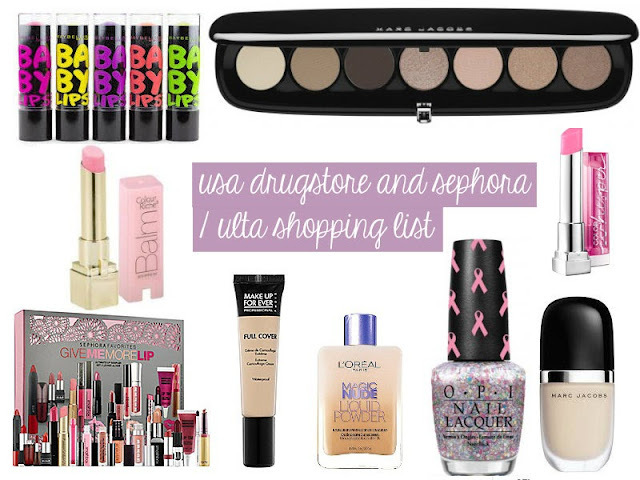 As I'm off to the states at the end of the month I've been making a huge list of things I might want to buy either at the drugstores or in Sephora and Ulta. I'm sure I won't buy all of this - I'll run out of money or suitcase space before I get half way through! I might also take a look at Benefit, Real Techniques, Nails Inc and Too Faced as although they're all available at home, they're a bit cheaper in the USA. Let me know if you can think of anything else I should add to my growing list! Also, if anyone would like to guest post for me while I'm away (I'll give full credit and links of course!) just let me know. Sadly I couldn't make it to Simple's blogger launch of their Kind to Skin + range and their online Simple Sense skincare tool - I hear I missed out on some epic healthy cocktails and smoothies. But, I've not totally missed out as I still got to try some of the new products. Simple have brought out a BB cream - the *Simple Kind to Skin + Perfecting BB cream. It's their first time creating a BB cream and comes in just one universal shade with UVA and UVB protection. I love BBs even though they can seem a bit over-done by all of the brands now. I don't get bored of trying out new ones as formulations seem to keep getting better with each new version . This one from Simple has a thicker consistency than most, which I like, and it has better coverage. It gives just about the right amount of moisture for my combination skin and does a very good job of evening everything out. This works well for me alone and as a base for makeup, which is one of my favourite uses for BB creams. At £8.99 it's a rival for my favourite BB cream from Garnier and I highly recommend it. There's also the *Simple Kind to Skin + moisture boost hydro mist. I've been mad on hydrating mists and sprays over the summer for cooling down, refreshing and hydrating. This one from Simple fits the bill entirely and delivers a wide, fresh blast with hydrating lotus flower. I'm loathed to pay much for facial mists, as really they are just fancy water in a bottle, so £5.99 for this one is fine by me. And I also tried the new *Simple Kind to Skin + brightening eye make-up remover pads. I'm not sure I've given these a fair test as my pack had a split and some of the moisture had escaped, so I found these a bit dry. Had my pack not been damaged I think I'd have liked them a lot more. They're a handy sized little pack for travelling when you don't want to lug around a separate eye makeup remover and cotton pads and they're a bargain at £2.99. Have you checked out any of Simple's new products? I really meant to share this collection with you a lot sooner, but work's really been getting in the way of blogging lately. On the bright side I've had plenty of time to play with these products and give you my proper opinion on them. The Sacred Hour is Illamasqua's latest collection - the sacred hour is at daybreak and sun set, as represented by these powerful collection images. Check out those amazing crystal adorned brows! The model styled in white is representing daybreak, and the one is darker colours is sun set - would you have realised that's actually the same model in both? The collection's made up of a beautiful eye shadow palette - very neutral by Illamasqua's usual standards - two velvet blushes, two nail polishes, a lipstick that I love, some stunning full on lashes, plus an amazing set of stick on crystals. The reflection eyeshadow palette's a real stand out piece in the collection as Illamasqua's eye quads often are. I'm delighted to see such wearable colours - some might think it's not so Illamasqua, but I really don't wear brightly coloured shadows and these are much more my kind of thing. It's hardly a dull neutral palette anyway - all of the colours are awesomely pigmented, shimmery and buttery soft. From left to right the colours are called precipice, acute, graphica and dart. Acute is my favourite - the perfect metalicy taupe. These are the two matte finish velvet blushers from the collection - Peaked on the left is a deep and dusky rose pink shade, and on the right Sleek is a warm coral shade. I have peaked which is a lovely shade to complement autumn colours. Just one lipstick in this collection - this lush berry shade is called Shard and it's been my transition piece taking me from Summer to Autumn. I've worn this loads already - you might have seen it as part of my Bella Swan makeup here. This is such a wearable shade I think - it's not too deep and dark, and not too bright, it's just that perfect wine sort of shade and I can't stop wearing it - it compliments Peaked blush really well too. It's a fairly matte finish and really long wearing. Here are swatches of the blushers and lipstick - from left to right Sleek blush, Peaked blush and Shard lipstick. The two nail polishes in the collection are truly like nothing else with really unique and pretty finishes. Facet on the left is a grey-brown polish strewn with fine bronze glitter. Hemlock on the right is a supernatural looking opalescent polish. In some light it looks like a soft creamy pearl shimmer and in others the pale green depth really shows up. I love a false lash, even though I'm a bit rubbish at applying them. I've never tried any Illamasqua lashes before - the pair in this collection is called lush lash and they're seriously full and dramatic. I've not tried these yet as I wanted to save them for wearing on a proper night. They seem like really good quality and I can't wait for an excuse to try them on. The last part of the collection has the true unique Illamasqua vibe - these are swarovski sacred stones which can be applied to the face over makeup. They're all unique shapes and sizes and are made up of opals in green, white and grey, amethyst crystals and golden shadow baguettes. You can get these applied at an Illamasqua counter as part of a make-up transformation and they're re-useable. Illamasqua have also just released a long awaited product - a new concealer. This is skin base lift which is an illuminating concealer for a flawless finish. This comes in a seven different shades to suit everyone and the concealer is peach toned so it's perfect for lifting the eye area. I watched David Horne applying this together with skin base lift in white for an amazing lifting effect around the eye, so I'm planning on picking it up next time I place an asos order. I really like this concealer for under my eyes - it gives really full coverage and applied with warm fingers and then blended with a brush it gives a really natural and smooth finish. The sacred hour collection was originally exclusive to Selfridges, but you can now also get it from Illamasqua, asos and Debenhams. Are you picking up anything from this collection? M&S is celebrating the roll out of M&S Beauty areas to stores across the country with a fortnight of free gifts with purchases. You can get this *bliss sinkside six pack worth £20, free when you buy any two bliss products. The sinkside six pack contains six mini bliss products which are perfect for travelling, and the lemon and sage scent is beautifully refreshing too. Or, with the purchase of any two diego dalla palma products you can grab the *rich lip balm absolutely free - it's usually £14. I've been using this lip balm this past week - I love how it looks like a lipstick but it's actually a really moisturising balm for super soft, smooth lips. It's got to be the chicest lip balm I own! If like me you need to get your tan on, you'll get the *express tanning mist (£16) thrown in as an extra treat when you buy any two Sienna X products. I've not tried Sienna X before so I'll be sure to let you know how I get on with this. And if you need to stock up on your facial skincare you might want to opt for two products from Nuxe, because you'll also get the *gentle toning lotion worth £13, absolutely free! These offers are all available right now and up until 11 September. You'll get the free products when you make qualifying purchases either online at marksandspencer.com or in store. There are also plenty of other offers going on for even more treats including free products from REN, Filgora, Lola, Crabtree & Evelyn, Formula and Autograph - that sounds like an excuse to get shopping! Are you planning to take advantage of any of these offers?